This is a little complicated and if you’re not a pro at using corridor targets, you may have difficulty…unless I do a good job with the description. Here’s hoping I do. I’d like to thank Steve Boon; a friend, client, and long time discussion group poster for the workflow he figured out a few years ago. Create your assembly as usual, except that you’ll need to add one more and make a small modification to your daylight subassembly. Add a LinkSlopeToElevation (renamed to Daylight Slope Invisible) and make sure that it is in the same assembly group as your daylight subassembly and above it in the order. Set its Omit Link to “Yes” and delete the Link Codes. If you don’t do this, we will see it in the corridor. We don’t want that. 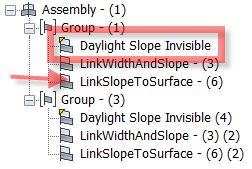 In the assembly properties, click your daylight subassembly (LinkToSurface in my example) and set it up as follows. 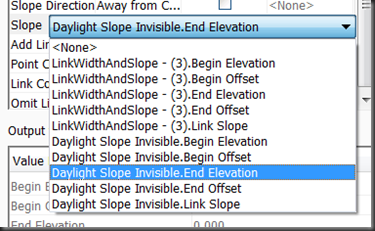 Set the “Get Value From” to Daylight Slope Invisible.End Elevation. What’s going on here is that we will be targeting that 2nd profile with the Daylight Slope Invisible and applying that elevation to the daylight slope. Imagine that the “Invisible” link will be drawn at a slope to the elevation specified by the “Daylight” profile stated above…0.5m, then transition to 0.25m. Your actual daylight slope will use these values as its slope value…0.25 (4:1) and 0.5 (2:1). 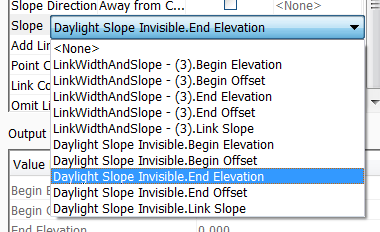 Lastly, set your surface targets for your daylight AND set the elevation target for the Daylight Slope Invisible. Rebuild the corridor and you’re done. Here’s my drawing if you need it to practice with. It is Civil 3D 2012. Good luck and I hope I was clear enough. This technique can be used for almost any parameter that requires a real number value as long as it’s not looking for an integer. I’ve used it to transition shoulder foreslope, ditch width, pavement and stripping thickness etc. The problem with this method shows up when you create cross sections. Even though you aren’t really using it, there is an assembly point down near elevation zero in your corridor and the section view will attempt to show it. Eventually Matt and I worked out another solution that doesn’t require the use of a profile to get the value into the assembly. Perhaps in the next post Matt?